Sidney Crosby beat Henrik Lundqvist in the 2nd round of the shootout to give the Penguins a 4-3 win over the Rangers Friday night at The Garden. It was the Rangers’ 3rd straight loss, and 8th straight loss at home. Chris Kreider tied the game for the Rangers, 3-3, with 11 seconds to go in regulation. Then,late in the 3-on-3 overtime, Matt Murray made a spectacular save on Michael Grabner to thwart a 2-on-0 rush up ice for the Blueshirts. After a scoreless 1st period, Jake Guentzel and Crosby staked the Penguins to a 2-0 lead. With 27 seconds to go in the period, Nick Holden‘s slapshot got past Murray for a power play goal that made it 2-1. In the 3rd, Bryan Rust took advantage of a Blueshirts defensive mistake and beat Lundqvist for a goal at 6:46 that made it 3-1. About two minutes later, Rick Nash scored a goal for the 5th time in six games, at 8:50, to make it 3-2. Nash took the rebound of a missed J.T. Miller shot and scored his 23rd of the season. That set the stage for Kreider’s game-tying heroics. With Lundqvist pulled for an extra attacker, Kreider scored his 27th of the season. Miller had two assists. Holden had a goal and an assist. Lundqvist made 32 saves. The Rangers [now 46-26-6, 98 pts] host the Flyers Sunday night at The Garden. Brett Burns scored a powerplay goal with 1:50 to go in overtime, giving the Sharks a 5-4 win over the Rangers Tuesday night in Sam Jose, but the point that the Blueshirts picked up was enough to clinch a playoff berth. The Rangers have now made the playoffs seven straight seasons, and 11 of the past 12 seasons. The Sharks snapped a six-game losing streak. The Rangers are now 3-4-3 in their last ten games. J.T. Miller scored two goal for the Blueshirts, and the streaking Derek Stepan scored a goal for the 3rd straight game, a power play goal with 0:23 to go in the 2nd period. Jesper Fast also scored for New York. Brady Skjei had three assists, while Kevin Hayes had two assists. The Rangers took a 4-3 lead in the first five minutes of the 3rd period, on goals by Fast [at 1:24] and Miller [a power play goal at 4:44]. The game remained 4-3 until Chris Tierney scored his 2nd goal of the game with just 2:15 to play in regulation. Then in overtime, with Nick Holden in the penalty box, Burns’ one-timer beat Henrik Lundqvist for the game-winning goal. Lundqvist made 30 saves in his 2nd game since returning from a hip injury. The Rangers [now 46-26-5, 97 pts] have five games remaining in the regular season. They host the Pittsburgh Penguins Friday night at The Garden. The Anaheim Ducks broke open a 3-3 tie with a pair of goals early in the 3rd period, and went on to beat the Rangers, 6-3, Sunday night in Anaheim. The game marked the return of Rangers goalie Henrik Lundqvist, who had been out of the lineup with an injury since March 7th. The win pushed the Ducks into 1st place in the Pacific Division, and kept the Rangers from clinching a playoff spot. Andrew Cogliano [at 2:19] and Patrick Eaves [at 4:23] made it 5-3 in the early minutes of the 3rd period. Nick Ritchie added an empty-net goal with 1:38 to play for the final 6-3 margin. The game was tied 2-2 at the end of one period, as the Blueshirts got goals from Rick Nash and Derek Stepan. It was Nash’s 4th straight game with a goal, and was the 2nd straight game that saw Stepan score. In the 2nd period, Josh Manson made it 3-2 Anaheim with a short-handed goal at 9:39, but the Blueshirts answered with a Brady Skjei goal at 13:10 that made it 3-3. Lundqvist stopped 28 of the 33 shots he faced. Mika Zibanejad had two assists for the Rangers. The Rangers [now 46-26-4, 96 pts] finish up the three-game road trip Tuesday night in San Jose against the Sharks. Antti Raanta made 30 saves, and Derek Stepan, Ryan McDonagh, and Rick Nash scored goals, as the Blueshirts shut out the Kings, 3-0, Saturday night in Los Angeles. The win improved the team’s road record to a league-best 27-9-1, and moved the Blueshirts to within two points of clinching a wild card berth in the upcoming playoffs. It was Raanta’s 4th shutout of the season. 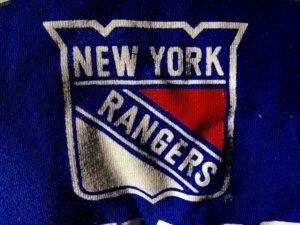 After a scoreless 1st period, Stepan got the Rangers on the board, putting the rebound of a Brendan Smith shot past Jonathan Quick at 13:02 for a 1-0 New York lead. It was Stepan’s 14th goal of the season. Then in the 3rd period, the Blueshirts capitalized on a power play chance. Andy Andreoff was given a four-minute minor penalty for a high-stick on Pavel Buchnevich. The Rangers scored just :04 into the man-advantage on McDonagh’s slapshot, at 1:50, to make it 2-0. Nash added a empty-net goal with 1:08 to play for the final 3-0 margin. Nash has now scored in three straight games. Mats Zuccarello and Mika Zibanejad each had two assists. Raanta looked sharp through, making a clutch save on a Tyler Toffoli shot in the 1st period, and stopping a breakaway by Jonny Brodzinski in the 2nd period. Brodzinski was making his NHL debut in the game. The Rangers [now 46-25-4, 96 pts] play the Ducks in Anaheim Sunday night. Henrik Lundqvist is expect to make his first start in goal since March 7th. Andrew Ladd scored with 7:22 to play, as the Islanders came-from-behind in the 3rd period and beat the Rangers, 3-2, Wednesday night at The Garden. It was the Blueshirts’ 7th straight home loss. And, since their six-game winning streak in early February, the Rangers are 8-7-3 in their last 18 games. With the win, the Islanders pulled to within two points of the Bruins for the final wild card spot. After a scoreless 1st period, Mats Zuccarello got the Rangers on the board with a power-play goal 2:46 into the 2nd period. Mika Zibanejad, from his knees, made a great pass to Zuccarello out in front of the Islanders net, and Zuccarello beat Thomas Greiss to make it 1-0. Anders Lee tied the score just 54 seconds later, taking a rebound and beating Antti Raanta for his 27th goal of the season to make it 1-1. But Rick Nash gave the Blueshirts a 2-1 lead a few minutes later with a great individual effort. Nash took a pass off the boards from Oscar Lindberg, beat the defense, and dribbled a shot past Greiss while falling to his stomach. It was Nash’s 20th goal of the season. The Islanders rallied in the 3rd. Nikolay Kuleman scored a quirky, pinball-like, power-play goal at the 5:02 mark of the 3rd to tie the game, 2-2. Joshua Ho-Sang‘s shot deflected off Anthony Beauvillier‘s skate and then off Kulemin’s skate and past Raanta for the goal. Then Ladd gave the Islanders the lead for good at 13:38, taking Lee’s pass from behind-the-net and scoring a power-play goal for the eventual game-winner. The Rangers penalty kill has now given up a power-play goal in eight straight games. The team has fallen to 23rd in the NHL in penalty kill percentage. The Rangers [now 45-25-4, 94 pts] start a three-game West Coast road trip Saturday night in Los Angeles against the Kings. Joseph Blandisi scored with 55 seconds remaining in overtime, as the Devils edged the Rangers in overtime, 3-2, Tuesday night in Newark. Blandisi took a pass from John Quenneville and beat Antti Raanta to give the Devils the win, as New Jersey avoided a season-sweep by the Rangers. After a quiet period-and-a-half, there was a flurry of goal late in the 2nd period. Quenneville made it 1-0 Devils with a power play goal at 15:16. But Oscar Lindberg answered 97 seconds later to make it 1-1. Taylor Hall made it 2-1 New Jersey at 18:22, just 89 seconds after Lindberg’s goal. In the closing seconds of the 2nd period, the two teams dropped the gloves and had a good, old-fashioned brawl. Nick Holden checked Miles Wood into the board, and Wood took offense. The two dropped the gloves, and eventually Jimmy Vesey, Brandan Smith, Blake Coleman and Nick Lappin jumped into the fray. Rick Nash tied the game, 2-2, with a power play goal at the 1:21 mark of the 3rd period, taking a pass from Kevin Hayes and backhanding the puck past Cory Schneider for his 19th goal of the season. Oscar Lindberg had a goal and an assist and Antti Raanta made 25 saves for his 15th win of the season, as the Rangers beat the Wild, 3-2, Saturday night in St. Paul. The Blueshirts, after losing at home to the Panthers Friday, rebounded for the win; it was the 10th time they have won the 2nd game of a back-to-back. After Eric Staal gave Minnesota at the 12:54 mark of the 1st period, the Rangers tied the game at 16:01 on a goal by Brady Skjei. Lindberg gave the Rangers a 2-1 lead at 7:46 of the 2nd, taking a pass from J.T. Miller and beating Devan Dubnyk for his 6th goal of the season. Jimmy Vesey pushed the lead to 3-1 at 17:34, off an assist from Lindberg. Minnesota closed it to 3-2 on a power play goal from Matt Dumba 4:51 into the 3rd, but Raanta and the Rangers defense held off the Wild for the win. The Rangers [now 45-24-3, 93 pts] have only ten games remaining in the regular season. They play the Devils over in Newark Tuesday night. The Rangers jumped out to a 2-0 lead in the first five minutes Friday night at The Garden, but the Panthers roared back to tie the game and beat the Blueshirts in a shootout, 4-3. It was New York’s 6th straight loss at home. Alexander Barkov, who scored his 19th goal of the season midway through the 3rd period, scored the game-winning goal in the 3rd round of the shootout. Mats Zuccarello scored twice for the Rangers. Brandon Smith added two assists. Zuccarello and J.T. Miller scored in the first 4:11 of the 1st period to give the Rangers an early 2-0 lead. Florida goalie James Reimer gave up the goals on the first three shots he faced, and things were looking good for the Blueshirts. Jonathan Huberdeau and Jussi Jokinen would tie the game with goals in the 2nd period. In the 3rd, Barkov’s goal at 7:23 gave the Panthers a 3-2 lead, but Zuccarello scored at 11:45, off a pass from Smith, to tie the game 3-3. After a scoreless 3-on-3 overtime period, the game went to a shootout. Reimer stopped Zuccarello and Mika Zibanejad. Vincent Trocheck missed, Barkov scored, and, in the 3rd round, Michael Grabner missed to end the game. Reimer stopped 29 of 32 shots. Antti Raanta made 34 saves. Ryan McDonagh scored a pair of goals, and Derek Stepan scored for the first time in 24 games, as the Rangers beat the Red Wings, 4-1, Sunday night in Detroit. The win was the team’s 25th road win of the season. McDonagh got the Blueshirts on the board late in the 1st, scoring a shorthanded goal with 27 seconds to play in the period to make it 1-0 New York. McDonagh deflected a backhand pass from Kevin Hayes past Detroit goalie Petr Mrazek. Frans Nielsen tied the game for Detroit with a power play goal 5:35 into the 2nd period, off some terrific passing by the Red Wings. But the Rangers would score two goals in a 37 second span later in the period to make it 3-1. McDonagh, in a wild scramble in front of the Red Wings’ net, put a rebound in for a goal at 16:50 and a 2-1 lead. Then, moments later, Hayes scored off a great pass from J.T. Miller at 17:27 to make it 3-1. Stepan’s tally, a power play goal with 3:59 to play in the game, was his first goal since January 17th against Dallas. 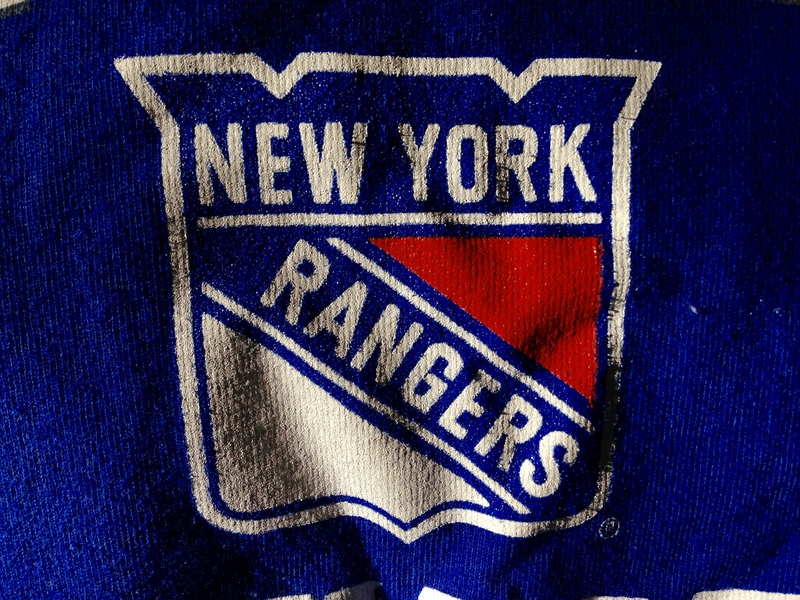 The Rangers [now 44-23-2, 90 pts] host the Tampa Bay Lightning Monday night at The Garden. 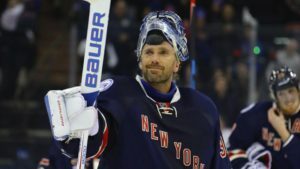 The Rangers announced Saturday morning that Henrik Lundqvist would be sidelined for 2 to 3 weeks with a ‘lower body’ injury. The team then recalled Magnus Hellberg from AHL Hartford; Hellberg will backup Antti Raanta. The Blueshirts have 14 games remaining in the regular season. “2 to 3 weeks” would likely mean Lundqvist is out til the end of March, missing ten games. There are four back-to-backs in that span, so Hellberg would likely start a few games. The Rangers play the Red Wings Sunday night in Detroit.